Raccoon, originally uploaded by andyskelton. It’s been a few days since I updated my blog but, IMHO, what an image to come back with. 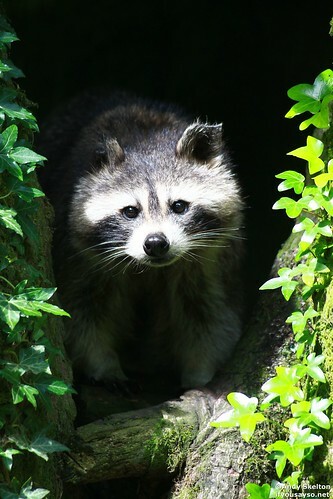 There aren’t that many zoo’s in the UK that have Raccoons (Procyon lotor), so when we visit one that does I try to make a beeline for them. I don’t know if it’s their rarity as zoological exhibits or my memories of their appearance in “the great outdoors” which endears me to them. This image seems to encapsulate their mischievous nature, as a photographer that’s all I can hope for – to reflect in a two dimensional image the feelings or characteristics of the subject matter. Now for the science bit: The photo was taken with a Canon 1D mark 4, with a sigma 80-400mm lens at 400mm/f5.6/iso 800 at 1/400second.